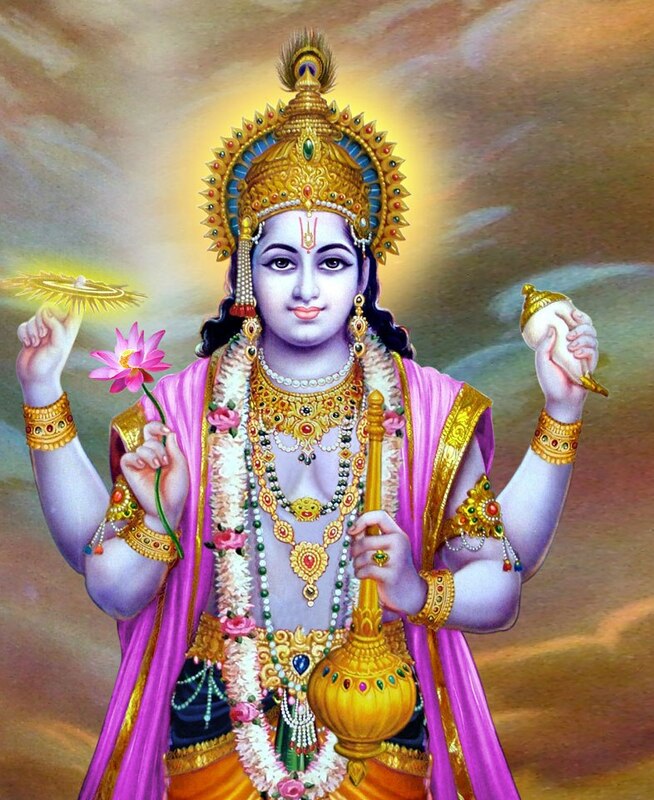 In this Part we will explore the meaning of the 22nd Shloka of Sri Vishnu Sahasranamam. Bhagavan is beyond death or decay and He is Omnipresent and Omniscient. He has his eyes everywhere. 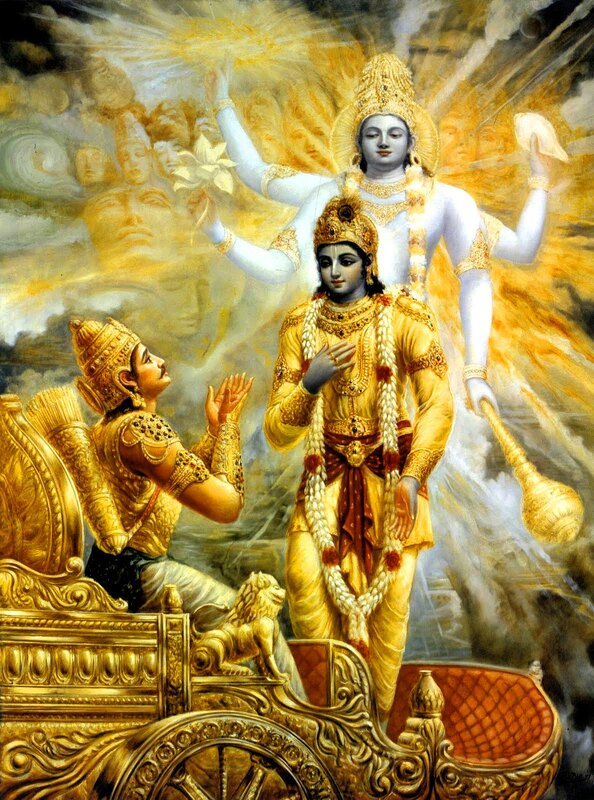 He destroys all evils and is the one who unites the devotees with the fruits of their actions. He also unites Himself with His ardent devotees and ever present for them. 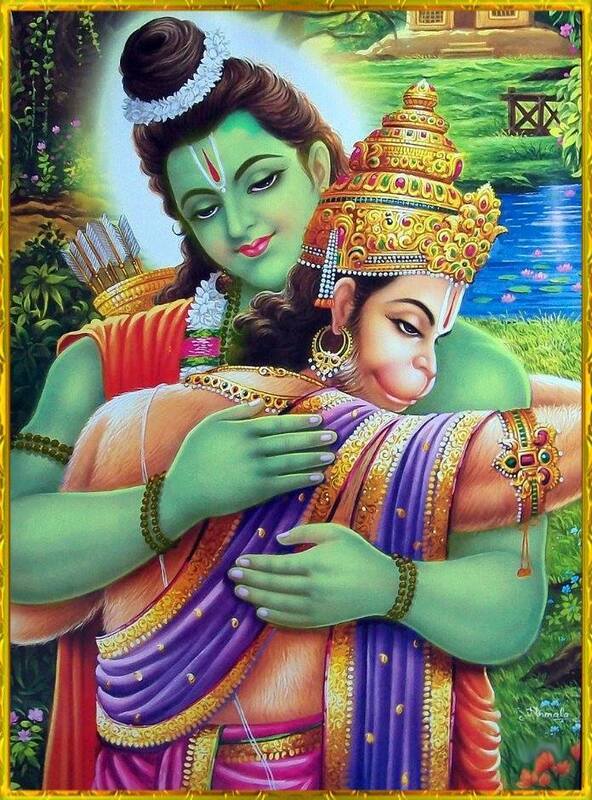 He is unwavering and firm in his stance with his devotees and does not change. He is the remover all obstacles and He is eternal. He is invincible and the asuras cannot match his might. He is the teacher of the Vedas and the path of Dharma. He is praised everywhere with wonder for his exploits and He is slayer of the enemies of the Devas. As Adi Shankara puts it ‘Mrityuh vinaashah tad heturvaa asya na vidyate iti Amrityuh – He is Amrituyuh because He has no death or any cause leading to death such as ageing, disease and decay’. ‘Mrutyuh yasya na asti iti amrutyuh’ – Birth, growth, decay, disease, and death, are the five modifications through which every finite object must pass. Everything that is born is bound to die. Since Bhagavan is not born, He is beyond decay, death, or other mutations. The author in Dharma Chakram points out that this Nama should remind us of the indestructibility or the eternal nature of the JivAtma. We need to mediate on Him without associating ourselves with the perishable body. Meaning: For the soul there is no birth or death. Nor, having once been, does it ever cease to be. The soul is unborn, eternal, ever-existing, imperishable and timeless. The soul is never destroyed when the body is slain. The word ‘Drik’ means one who sees and ‘Sarva’ means all; So Sarvadrik means one who is omniscient. Bhagavan is the Seer and Knower of everything at all times in all beings. He is the witness of all, and sees those who are well-disposed or hostile or indifferent to Him as the Ruler of all and rewards them according to their deeds. Sri Adi Sankara says ‘Praaninaan kritaakritam sarvam pashyati svaabhaavikena bodhena iti – By His very nature He oversees all acts of omission and commission of all beings hence He is called Sarvadrik’. He was earlier described as ‘Saakshi’ in Nama 15 with similar meaning. The author in Dharma Chakram points out that the concept is simple but worth repeating – that this Nama should remind us that it is important to be pure in thoughts, words, and deeds since He is omnipresent and ever watchful of all beings at all times. It is easy to swerve from the path of Dharma but we should be aware that He is the All-seeing. 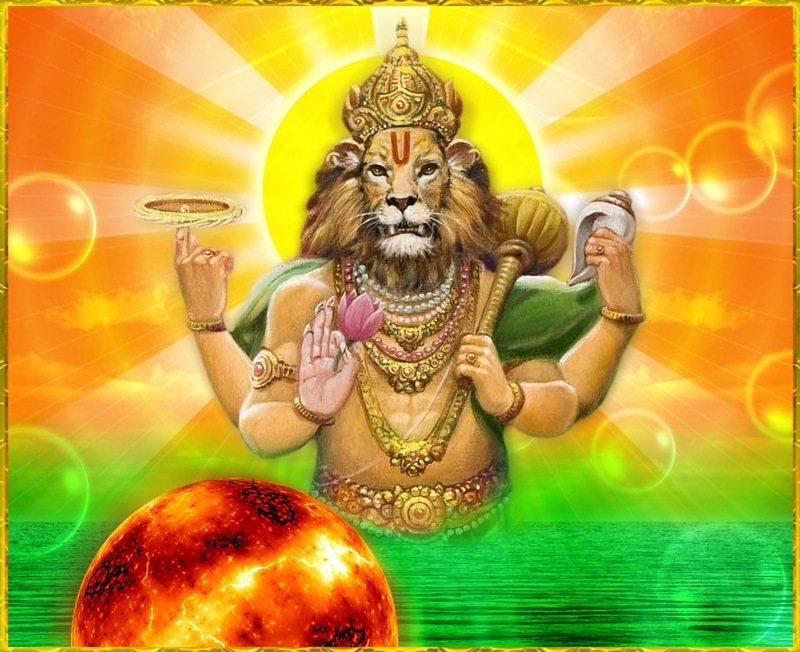 Sri Parasara Bhattar interprets this Nama as the One who manifested as Narasimha with half a body of lion and half a body of man. Swami ChinmayAnanda points out that even taking the literal meaning of ‘Lion’ for ‘Simha’, He is the Lion at the mention of whose name all the animal passions flee from the jungle of our mind. In the Bhagavad Gita (Chapter 10 Verse 30), Bhagavan says “mrigaanaam ca mrigendro’ham – Among the animals, I am the King of animals – The Lion”. In Dharma Chakram, the writer says that meditating on this Nama with its meaning will give us Veerya that will destroy the evil in our thoughts, words, and deeds. It is only with a strong personality we can overcome the negative forces around us and realise Him. It is necessary to be good and strong (NallavanAgavum VallavanAgavum as the saying goes in Tamil). This is to be interpreted as ‘Sandhatte iti Sandhaataa – He is the one who unites’. Sri Parasara Bhattar, gives the example of Prahlada, who was firmly united with Bhagavan even as a young boy and this was only made possible because of His grace as ‘Sandhaata’. The second meaning is given by Sri Adi Sankara. The description – ‘prahlaadaadyaih sandhaataa samshlesha-karanaacca sah’ – meaning one who unites the beings of the Universe with the fruits of their actions, that is the Phaladaata or the fruit giver’. Sant Tukaram was born in 1577 AD in a village called Dehu which is about 20kms from Pune. Tukaram was a family man and ran a grocery store which was his ancestral business. He was a very pious man, always chanting Abhangs with his heart filled with love for Vitthal, with a Tambura in hand. He would not take money from his customers when they greeted him with “Rama Krishna Hari”. He equated them with a Sadhu and hence, thought it would not be appropriate for him to collect money from Sadhus. When pilgrims passed by his shop singing Abhangs, he would leave the shop and join them to go to Pandharpur with them. Sant Ramdass, who was Guru of Shivaji Maharaj, had also heard about Tukaram. He asked Shivaji Maharaj to meet Tukaram on his to visit Dehu. As his Guru had asked, Shivaji met Tukaram and understood his greatness. He started to visit him frequently and considered Ramadass and Tukaram as his two eyes, always consulting them for advise. One day, Shivaji came to offer some gold coins as gift to Tukaram and prostrated in front of him. Tukaram immediately got up and ran away. Shivaji could not understand this reaction and asked the Sishyas for the reason. They explained that since he brought gold, Tukaram was upset. Shivaji explained that he was worried as to how Tukaram would be able to feed all the Sadhus in his house every day without money. Shivaji then apologised to Tukaram for his conduct and placated him by saying that he knew Tukaram was a Sadhu and doesn’t desire for money. But he said that since there were so many Sadhus eating with him every day after the Bhajans and Kirtans, this money would be of help to feed the Sadhus. Tukaram asked Shivaji that if he was worried about having known him only for a few months now, wouldn’t Vitthal be more worried about Tukaram as He knew him from the day he was born and for so many births. Tukaram used to sing Abhangs daily in which many Sadhus and Baghavathas would participate. However, there was a scholar called Rameshwara Bhatt in Dehu who did not like Tukaram’s popularity. Bhatt was well versed in the Sastras and was preaching Dharma Sastras. Not many came to his discourses as most of them went to Tukaram’s Kirtans. He contended that Tukaram was a Vysya who has not read the Sastras and hence was not qualified to preach. Bhatt claimed that since he was a Brahmin and had read all the Sastras, he knew more than Tukaram who was simply writing and singing his own poems. When Tukaram learned about Rameshwara Bhatt’s views about him, he prostrated to him and asked him if he had done some mistake in his Abhangs. Bhatt told him that he was doing a great sin and also leading others to commit sin by listening to his Abhangs. Tukaram with his tear filled eyes said to Bhatt that he did not know that he was committing a sin. He said he would do whatever Bhatt wanted as he was the most scholarly man in that place. Bhatt asked him to stop singing his compositions and to throw all of them away in the river. Tukaram tied all his compositions in a silk cloth and with a heavy heart threw it into the Indrayani River. He was thinking that he had only written about the beauty of Vitthal. He could not sing any more of his Abhangs but he knew nothing other than singing the praise of Panduranga. He kept saying “Panduranga Panduranga” with his eyes full of tears, sitting under a tree near the river. The next morning when the priest opened the Vitthobha temple in Dehu, he saw a bundle on Vitthal’s head. The priest rushed in to remove it and found that the bundle was wet. He opened the bundle and found that it had all the Abhangs of Tukaram. He went running to Tukaram who scolded him for retrieving it from the river. When the priest explained the miracle Tukaram was elated with joy and with tears in his eyes he thanked Vitthal for acknowledging his poems. On hearing this leela of Vitthal, Rameshwar Bhatt came running to Tukaram and sought his forgiveness and also praised him as a Mahatma. 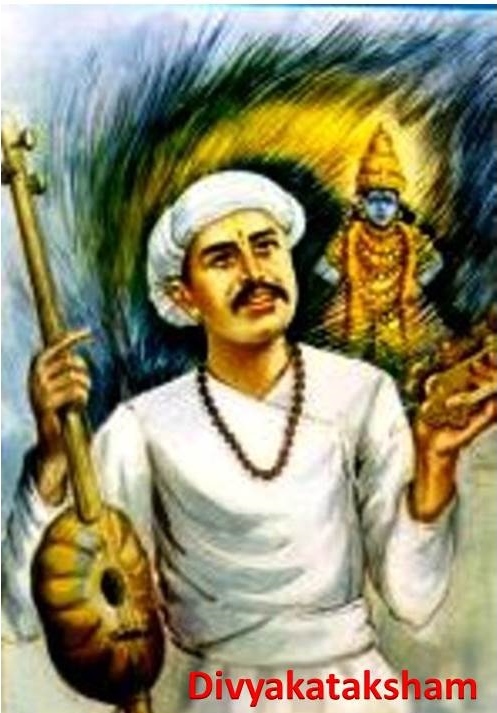 After this incident Tukaram’s Abhangs became very famous and many people started singing his songs and his collection of Abhangs came to be known as Vaishnava Veda. One day his shop was looted by some miscreants as he had left it open and left with a group of pilgrims to Pandharpur. On his return his wife gave him some jewels and asked him to mortgage it to restock the store. However, while returning home, he saw some group of beggars singing about Vitthal and promptly distributed the money to them and returned empty handed. Next day his wife Jijabai was leaving for work and on seeing her going out for work, Tukaram felt bad and agreed to go to work to run the family. But wherever he went the people would prostrate to him welcome him as everyone knew him to be a great saint and had very high regard for him, they declined to employ him. They would offer him whatever he wanted for free and not embarrass them by working for them. This was not acceptable to Tukaram who would not take anything for free. Tukaram decided to go to neighbouring villages in search of a job. He came across an old man who had a big field and asked him to take care of his field for the next two months. Tukaram said he will return after giving some money and grains to his family. Upon his return to the field for work, he was engrossed in his Abhangs. Whenever a Sparrow or a Cow came and destroyed the field, Tukaram would look at it as Panduranga. After two months when the old man came to see the farm he was very angry that his crop had been destroyed. He saw that Tukaram was still standing on the elevated platform, dancing and singing the praise of Vitthal, totally oblivious to what was happening in the field. The old man was angry and asked him to compensate for the loss of crop. Tukaram pleaded that he did not have any money and would not have come for a job if he had. The old man said that if he does not pay him the compensation for loss he would take him to the King for justice. Tukaram begged the old man not to take him to the King but punish him directly and would agree to whatever punishment he gave. This was because the King, Shivaji Maharaj, was his disciple who would pay the old man on his behalf. The old man then told him that it is of no use for him to punish him and that he only wanted his money back. Tukaram did not know what to do and said “Panduranga” with tears filled in his eyes. Hearing this, the old man got wild and asked him why was he saying Panduranga as if he was Tukaram Maharaj. When Tukaram told him that he was indeed Tukaram, the old man prostrated to him and apologised for being harsh and told him that his farm was now blessed with the dust from his feet which was enough for him to get a better yield next time. The old man then gave him a load of sugarcane to sell and take the money. On the way back he saw the temple and got down to have a darshan of Vitthal. There were some children playing and when they saw him with a load of sugarcane they went to him and asked him if they could take one. Seeing the kids asking for the sugarcane he distributed all the sugarcane to the kids and started singing and dancing with them. All the children were now chanting “Panduranga Hari, Vasudeva Hari and Rama Krishna Hari”. He returned home empty handed. Jijabhai on seeing him back home asked him if he had got the money. He told her that he had distributed all the sugarcane to the children near the temple and had no money. She was angry that he didn’t think about his children and started to scold him. As he had one sugar cane left in the cart, he gave it to her. She was enraged by that and beat him on his back with it breaking it into two. Tukaram smiled and told Jija that Vitthal had broken the sugarcane into two equal halves using her hands and his back so that both get an equal share. Hearing this Jija was stunned and realised the greatness of the man. The whole of Dehu considered him to be a saint, Shivaji Maharaj seeks his advice, Panduranga speaks to him directly, but she, in spite of being his wife, was engrossed with worldly affairs. She prostrated to him and sought his forgiveness. 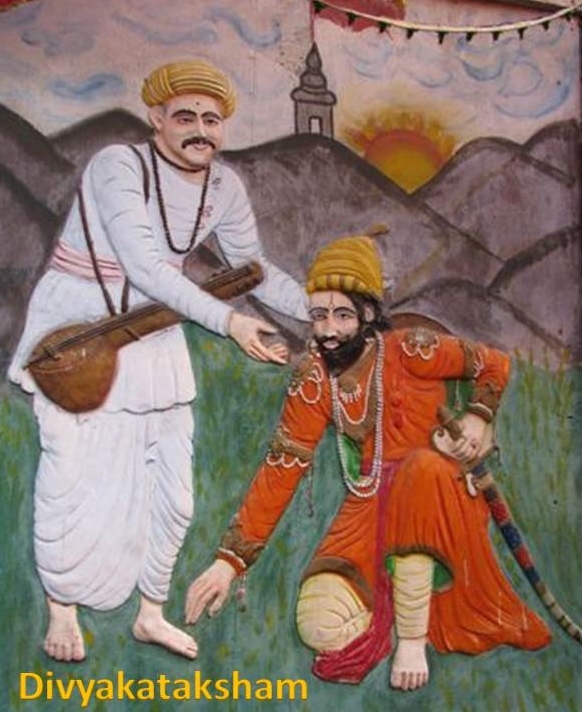 One Ekadashi day, Tukaram was performing Kirtans and Shivaji was listening to it with Bhakti. In the meantime, Muslim invaders heard about his whereabouts and a big troop of 2000 soldiers came to arrest him. They surrounded the house in which they were singing bhajans and Shivaji’s informers whispered the situation to him. 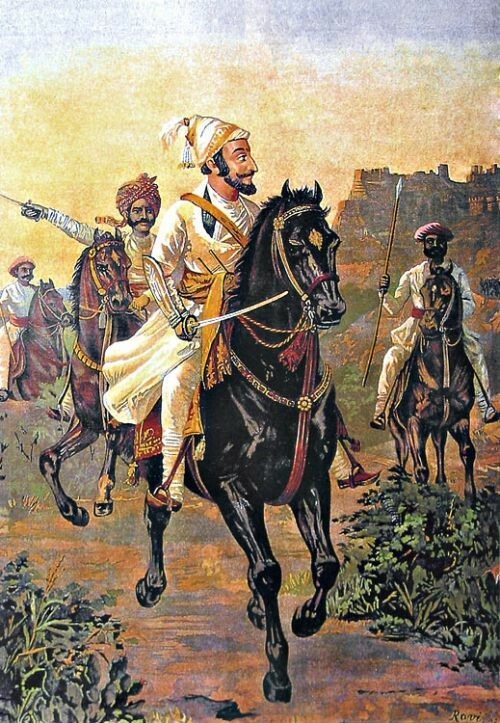 Hearing this Shivaji was worried and one of his bodyguards asked Tukaram if they could leave. Tukaram asked them to stay put and ordered that no one should leave till the Kirtan is over. Hearing this Shivaji sat down and continued to listen to the Abhangs. He thought to himself that none other than Vitthal can save him now and if he does not, he would be fortunate to die on an Ekadashi day listening to Abhangs in the company of Sadhus and Saints. One of the Muslim spies came into the house to check if Shivaji was there but could not find him. On hearing this, the commander told him to get in and kill as many people as possible as that way they would definitely kill Shivaji. Lord Vitthal immediately took the form of Shivaji and came out of the house on a horse. He then started riding his horse. The soldiers who saw this started chasing him but no one was able to catch him. The troops chased him for several hours and finally they had travelled into a jungle trying to catch Vitthal who looked like Shivaji. Vitthal suddenly disappeared and the soldiers blamed one another for not being able to catch Shivaji. The commander just could not understand how an army of 2000 soldiers could not catch one person. Vitthal whispered to Tukaram on what had happened and asked him to continue his Abhangs without any fear. 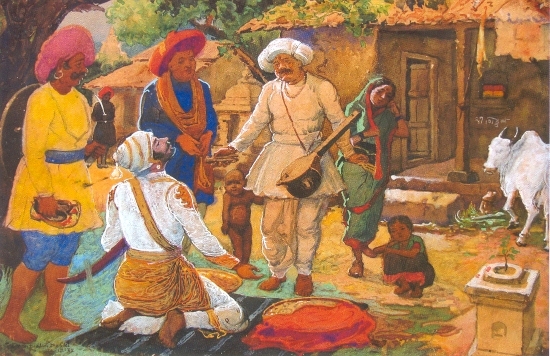 Once Tukaram was invited to perform his Sankirtans in Chinchwadi, near Pune. One day a Brahmin came to give discourses on Ramayana to Chinchwadi, in order to collect money for his daughter’s marriage. When the Brahmin saw that everyone in the village went to have their bath only by around 8am, he thought that this may not be a good place as they were all very lazy. Upon inquiry, he found out that Tukaram was performing Kirtans till about 4 or 5am in the morning, and the villagers would catch some sleep after the Kirtans and then go for their usual work. Hearing this, the old man knew that no one would be interested in his discourse and decided to leave the village. One of the villagers informed about this to Tukaram which prompted him to meet the Brahmin. He prostrated to him and said that he would also participate with the villagers to listen to him. On the last day the organisers started collecting money for the Brahmin. A miser cleverly left for a nearby village to avoid his contribution. They asked his wife for some contribution and she said that he had locked everything before he left. She gave them an old leaking vessel that was used to wash their legs. After giving the entire gifts, the organisers who wanted to make fun of the miser said that the miser had given a golden vessel and handed it over to Tukaram. The miser’s wife felt bad and thought to herself that she would definitely have given a golden vessel to the Brahmin if her husband had permitted her. When Tukaram received it the vessel miraculously turned into gold. The lady was happy that her devotion and prayers were answered. One day when Tukaram came home Jija was performing Lakshmi Pooja at home. Jija told him that if she did this Pooja, she would get more wealth. Tukaram was not happy as she was doing Kamyartha Bhakthi (praying to god and expecting something in return, just like a trade) and felt that one should not do that. She continued with her Poojas and after a few weeks she had a stroke of luck and got money. That day when Tukaram came home he saw the changes at home and Jija told him that she had reaped the benefits of doing Lakshmi Pooja and went in to bring food for him. On hearing this Tukaram went out without even having his food. It was over 3 days and he still didn’t return. She knew that he would often go to Pandharpur without informing her and thought that he would have gone there. She waited for a month and then decided to go to Pandharpur. She searched for him there but could not find him. She asked the other Sadhus if they had seen him but none had seen him. Jijabai was really worried and went inside the temple and prayed to Vitthal. That night Vitthal came in her dream and told her that Tukaram was in Dehu and showed her the hill where he was sitting and singing his Abhangs. He also told her that he has not been having food from the time he left home. The next morning Jija left for Dehu, climbed up the hill to the place where Tukaram was seated. She found him seated on the stone, and found that he was very weak but His voice still had the same energy. 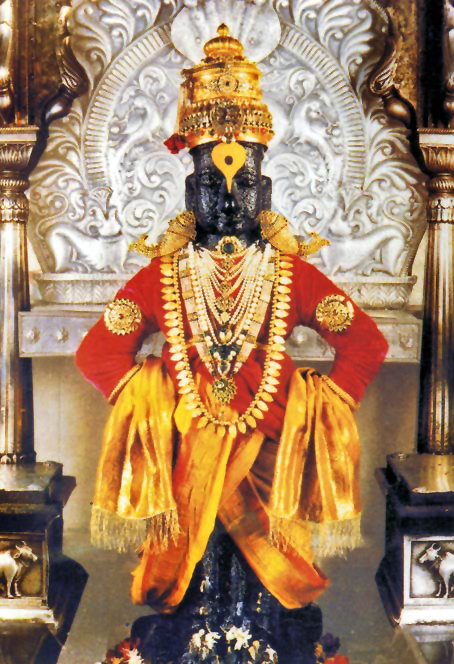 He was singing loudly in the praise of Vitthal. She stood in front of him with folded hand and tears in her eyes. She told him that it was Tukaram who was more important to her than jewels and money. Tukaram asked her to distribute all the wealth to the poor and then he sang some Abhangs to advise her. He then went back with her to their house. One day Tukaram called all his disciples (in 1650 AD) and told them that he will be going to Vaikuntam and asked them to assemble on that day. On the appointed day all his disciples had assembled on the banks of Indrayani River and were singing Abhangs. Vitthal had sent his Garudavimanam and Tukaram boarded the same with his body. 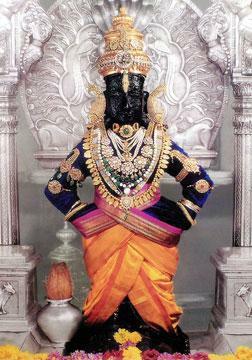 The whole village saw him go to Vaikuntam and unite with Lord Vitthal. Bhagavan is Sandhaata as he unites his devotees with HIM. Sandhi means union. Sri Parasara Bhattar gives the explanation that this name indicates that He is always united with His devotees, and hence He is Sandhimaan. This is the other side of the nama Sandhaataa. He not only makes the devotees unite with Him; He also unites Himself with his devotees. Similarly HE is a fruit giver as well as the enjoyer of fruits. Sri Adi Sankara says ‘Phalabhoktaa cha sa eva iti Sandhimaan meaning He is also the enjoyer of fruits’. ‘PrahlAdAdyaih nityasandhih yasya syAt sandhimAn smritah’ – One who is in permanent union with the likes of Prahlada. Sri Adi Sankara gives the interpretation that He is Sthira in the sense that He is Constant, being always the same, free from birth, decay, etc. – sadaika rUpatvAt sthirah. Sri Parasara Bhattar’s interpretation is that He is Sthirah since He is firmly attached to His devotees in spite of any wrongs by them – apacAre’pi acAlyatvAt sandhAne sthira ucyate. One who is the root of all sounds (akshara “a”). 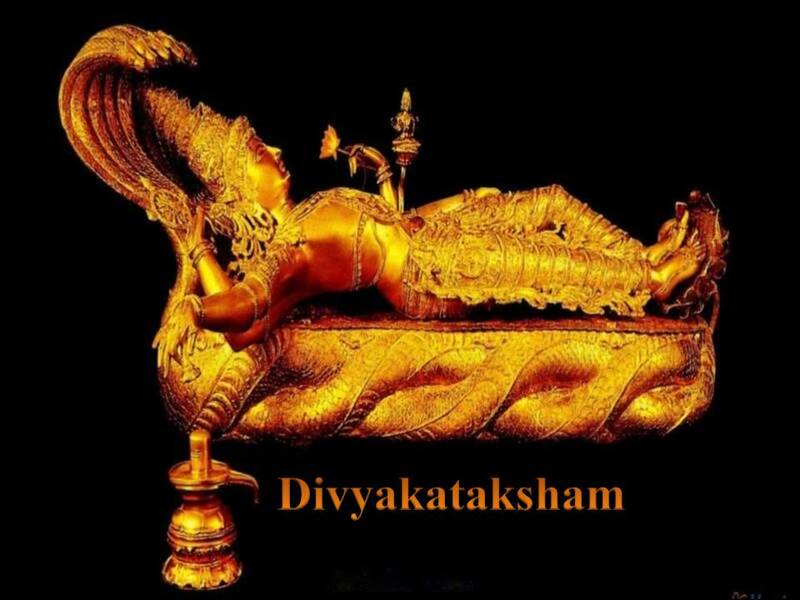 Dushkaram marshaNam asya iti durmarshaNah – One who cannot be conquered or vanquished. by His enemies. Sri Adi Sankara explains this as ‘Marshitum sodhum daanavaadibhir na shakyate iti Durmarshanah – He is called Durmarshanah because He cannot be overcome by his enemies such as the Asuras’. Swami ChinmayAnanda gives a very interesting perspective for this Nama. We may swerve from His path, and satisfy our sensory urges, but after being born over and over, we ultimately have no choice except to follow His path. 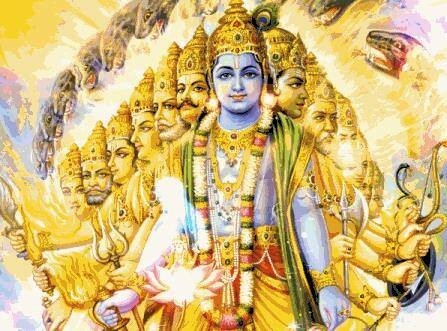 In the lesser levels of evolution, we may deny ourselves the peace and joy of living the spiritual values, but in the end we will be seeking the feet of Vishnu for real happiness and true achievement. Thus, His is the final victory. The root from which this Nama is derived is mrish – sahane which literally means as One who is difficult to bear (for His enemies). Sri Satyadevo Vasishtha starts with this, and interprets the nama to mean that Bhagavan is Durmarshanah because His Tejas cannot be confronted in His forms such as the Sun. He also points out that this principle is demonstrated by Bhagavan in everything in this world – the Moon cannot stand the Tejas of the Sun, the brightness of the stars is diminished by the presence of the Moon, the power of Agni is subdued by that of water, and water vapourises in the presence of Agni. An alternate interpretation for Durmarshanah is that it can also mean one who cannot be easily understood, based on the alternate meaning for marshitum which is jnaatum – duhkhena marshitum Sakyah DurmarshaNah. The interpretation by Dharma Chakram is that that He is DurmarshaNah because He destroys the evil Asuras; this derivation is based on the daatu word ‘mri’ which means to kill in order to protect the Devas. Meditating on this Nama with its meaning will help in driving away the evil thoughts from the devotee’s mind. ValmIki who was ignorant in the beginning, meditated on the ‘Rama’ Nama, and this led Valmiki to ultimately to realise Him. The word is derived from Saasu – anushishtau to teach, to govern, to correct, to advise. Saasti viSvam iti Saastaa – One who teaches the Vedas to the world and governs is Shaasta. The words Shastra, Shiksha etc. are derived from the same root word. Shaastaa refers to a ruler or one who imposes order and discipline on the world. 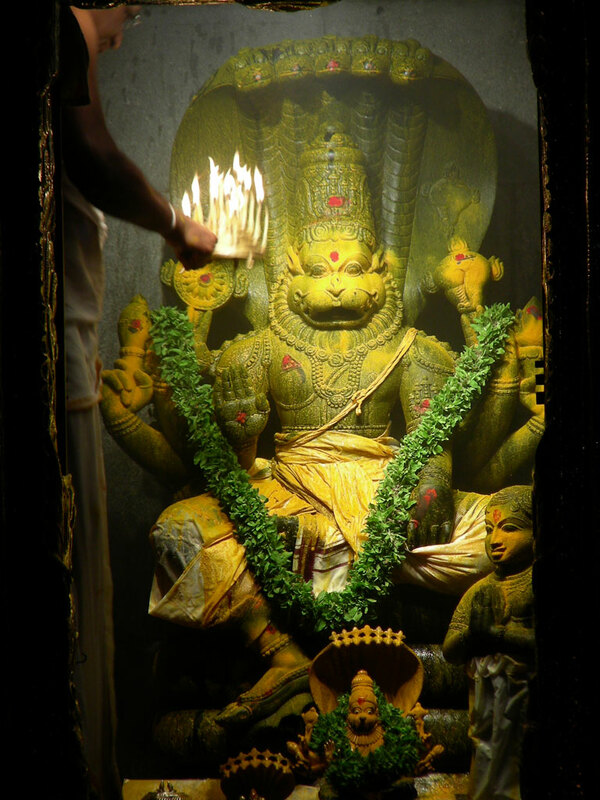 As Adi Sankara explains ‘Shruti Smrityaadibhih sarveshaam anushishtim karoti iti Shaasta – He is called Shaasta because He rules over all using Vedaas and other scriptures as his tools of discipline’. Sri Parasara Bhattar gives the meaning that He righteously punishes those who are hindrance to His devotees, and so He is Shaasta. One who’s Atma is of a special Nature. The interpretations except the last one are based on the different ways in which the vyAkhyAna kartAs have construed the “vi” in VishrutAtma. Sri Parasara Bhattar gives the interpretation ‘Vismayena’ meaning with wonder and adds that this praise in wonder is by all, at all times, and at all places. He is also VishrutAtmA since he is sung through various means such as gAnam, arcanam, etc., and through Sama Veda, Yajur Veda, etc. Visheshena Srutah Atma yena sa VishrutAtma – One who is known to be different from the JivAtma, One who is Sarvajna, SarvaSakta, Sarva-niyantaa. His Atma is pure Shadgunya Paripoorna form, unassociated with any external form and unimpacted by the effects of karma. This Nama consists of the three words sura, ari, and haa, where Sura refers to Devas, ari is the enemy, and hA is the destroyer. He is Suraarihaa because He is the destroyer of the enemies of the Devas or the destroyer of the Asuras. Sri Parasara Bhattar points out Bhagavan’s slaying of Hiranyakashipu in this context. Swami ChinmayAnanda points out that meditating on this Nama’s meaning leads to the destruction of the demons in our mind that give rise to the Tamasic and Rajasic Gunas. One who drives away all the above inimical negative tendencies is Suraariha. Sri Satyadevo Vasishtha has included the following Rig Vedic mantra (1.36.15) and says that it is his own personal experience that chanting this mantra helps in warding off all evils or evil-doers. Meaning: Preserve us Agni from the fiend, preserve us from malicious wrong. Save us from him who fain would injure us or slay, most Youthful, thou with lofty light. 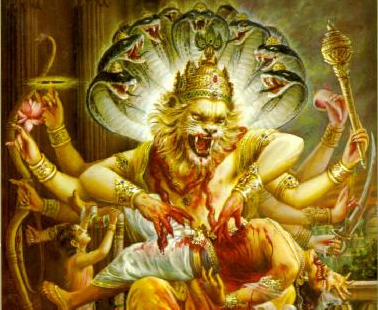 All the Namas in this Shloka have been interpreted by Sri Parsara Bhattar as relating to the description of the Gunas associated with Bhagavan’s Narasimha Avataar. Bhagavan is beyond death or decay and He is Omnipresent and Omniscient, so He is Amrutyuh. He is Sarvadhrik as He has his eyes everywhere. He destroys all evils, so He is Simhah. He is the one who unites the devotees with the fruits of their actions as Sandhaata. He also unites Himself with His ardent devotees and ever present for them and hence He is Sandhimaan. He is Sthirah as He is unwavering and firm in his stance with his devotees and does not change. He is the remover all obstacles and He is eternal, hence Ajah. He is invincible and the asuras cannot match his might, so He is Durmarshanah. He is the teacher of the Vedas and the path of Dharma, so He is Shaasta. He is praised everywhere with wonder for his exploits, so He is called VishrutAtma and as He is slayer of the enemies of the Devas, He is Suraarihaa. Your dedication in giving your best to this work is stupendously phenomenal!!! Thank you Jayashree for your kind words 🙂 God bless you! Hari Om! Thank you sir, for this divine narration. Thank you so much 🙂 God bless you! Hari Om! Blissful post, thank you for sharing such wonderful explanation. I have gone through several blogs like Ancient Indians’ Speaking tree’ Sadagoppan & Hindu Pedia’s. But none like this with lucid explanations, images, stories, & awesome youtube links. Quiet a task. Great job! Thank you for your kind and generous words. It’s indeed flattering. We make every effort to keep it interesting as well as informative. Glad to learn that we are achieving that objective. God bless you! Thank you once again 🙂 Hari Om! Thank you Sowjanya! May God bless you! All the best for your higher studies! May he guide you all the way! Hari Om! Great commentary! Shall follow henceforth. Hari Om! Thank you Tanisha! May God bless you! Hari Om! Amazing story of Sant.Tukaram. These stories shows us how much selfless one has to be in feeling gods love. In this materialistic world when people are fighting tooth & nail for grabbing what ever their hands can reach out to, there are people like Tukaram who don’t like to accept anything for free. Excellent story & Vishnu Sahasranama narration. 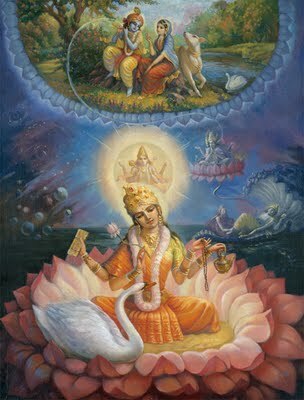 Om Namo Narayanaya! Thank you Nirmalaji! Indeed, the selfless acts of these Saints gives us wonderful insights on the path of Dharma that we should all strive to follow. A tall ask but we have to begin somewhere! Glad that you are enjoying the blog 🙂 Hari Om! Nicholas Herman gave his respects to both of you. He is bedridden with a paralytic stroke. I am going to see him today & will read this to him. I am very sorry to hear that Nicholas Herman is ill. Wish him a speedy recovery with Bhagavan’s grace. Thank you Sir, will convey your message. I am very sorry to hear that Nicholas Sir is indisposed. I will pray for his speedy recovery and good health! Please convey my regards to him. May God bless him! Hari Om! Super! Super! Super! This is a real boost to us week after week. Though the Tukaram story was long it was very interesting to scroll through. The Nama on Sandhata is very interesting, it’s very important to unite in any relationship, be it god, human relation, even a pet. But your reference about Tukaram is above all, uniting with Him is the ULTIMATE.. Chance ye illai! Semma kadhai!!!! Hats off to you, hope to see more such stories where people can make some time to connect with god in-spite of their busy schedule. Especially people like me. Awesome pictures too.. Double thumbs up Sir!!! God bless! Thank you and good to know that you have become an avid follower of the blog too 🙂 God bless you! Hari Om! Thanks Sridhar…the story of Tukaram was an added bonus…we indeed are blessed to read and much credit goes to your continued and consistent effort to uplift us. You are welcome Gowri! Good to know that you are liking it 🙂 Hari Om!